Welcome to the best English Bible of all time: King James Version! This application allows you to download the King James Bible on your phone or Android tablet. 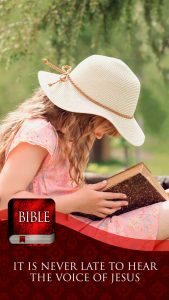 Now enjoy the Word of God for free on your phone! For a Christian, it is extremely important to read the Bible. It’s a way to feel more close to God. We offer you an easy-to-use app to read and study the Holy book. The Bible will bring you peace, and will help you to answer all your the questions about life. Download this holy bible app and choose the verses you like most. The King James Bible online will surely change your day and your life.